Vola have released an animated video for their track Stray The Skies. 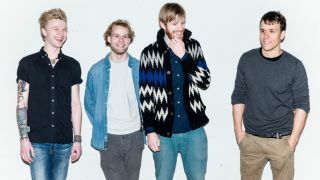 It features on the Danish outfit’s upcoming debut album Inmazes, which is out on September 16 via Mascot Records. They previously issued promos for Starburn and Gutter Moon. The band say of the album: “It tries to capture this feeling of being trapped in mental mazes and not being able to fully experience happiness, basically. How is this struggle visualised in your own mind and how do your surroundings react to the behaviour caused by it. They’ll head out on the road across Europe with Katatonia and Agent Fresco – a run of dates which kick off later this month. Vola say: “We are exceptionally excited about joining Katatonia and Agent Fresco on tour around Europe. Inmazes is available for pre-order via iTunes.